His current exhibitions of work at the Gallery at Library Square shows his painterly responses to these dynamics of urbanity. Franzoni works in two different but related styles in this show. One style is street-influenced, with abstracted tubular forms that cross and intersect in a maze-like pattern ultimately ending in hands, feet and heads. They are painted in tones of beige and gray, and infused with repeating geometric motifs. The title of one, “Prosperity,” is in contrast to the skull at its center, the references to Salt Lake City’s west-side gang life, and the two blood-red stripes that divide the canvas in the same way I-15 divides the city. Divisions happen within cities not only between the rich and the poor sides, but also between poor and poor and the rival gangs of Bloods and Crips are evoked in a similar piece. His other body of works are sumptuously rendered, semi-surreal, and very real, iconographically infused portraits. In “Hijab,” a Muslim woman, her youthful and gentle presence exuding from the canvas, has her face decorated with henna—the words “PEACE” and “LOVE” are barely visible beneath her covering. Monarch butterflies dripping in paint are flying above her, against a background where a traditionally Western aristocratic coat of arms is repeated across the surface in gold and red. This beautiful young woman is rendered strongly at odds with her environment and culture, thus at odds with herself. 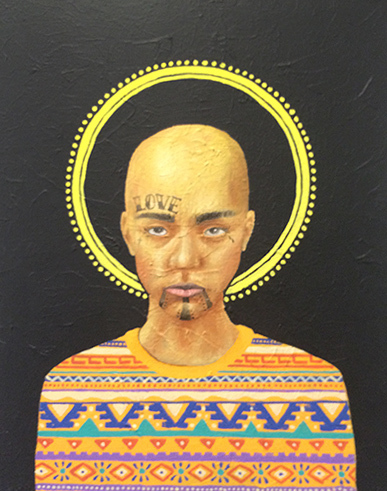 In “Halo,” an African American young man is similarly decorated with henna, with “LOVE” tattooed over one eyebrow and a thin goatee tattooed on his chin. While his face is fully modeled, his clothing is depicted in a flat way, the colorful, graphic pattern suggesting Africa, while above him, against a black background, is a golden Catholic halo—creating a context between dominant cultures and dominating religions and making for aggressive subjects. “The ways in which our identities, as multidimensional and sociopolitical networks of characteristics, values, sentiments, and attitudes can be, at times, incredibly antagonistic,” says Franzoni. But, he says, it also “exemplifies a certain interrelatedness between living beings.” There is sanity in difference. Reality in absurdity. And a strength in these dynamic works. 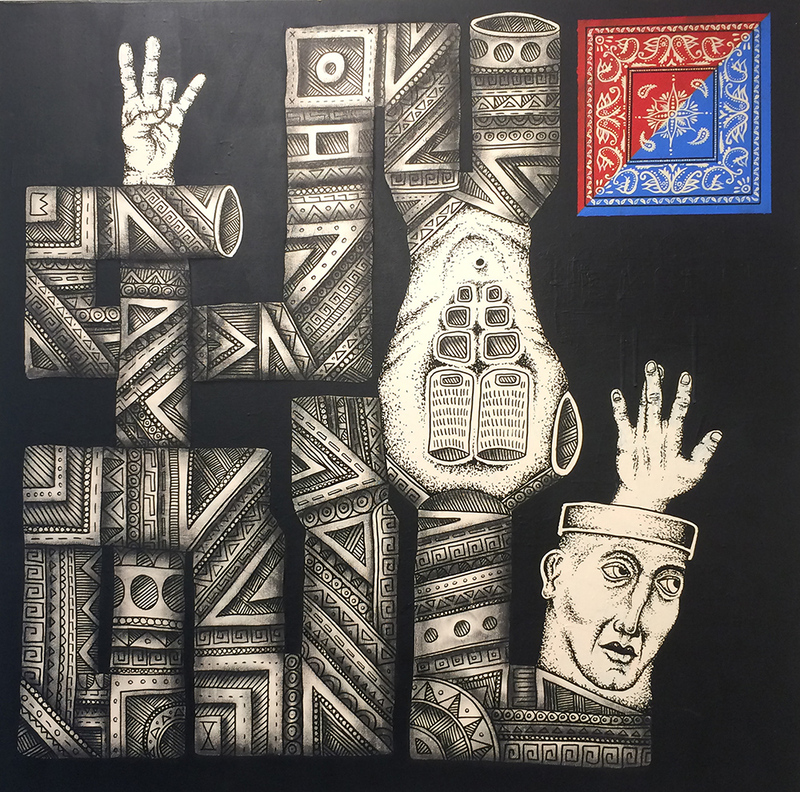 Disrupted Identities: Works by Zachary Franzoni is at the Gallery at Library Square in Salt Lake City through November 13.